The sealer is designed to prevent leaks in the engine cooling system. The sealer is designed to prevent leaks in the engine cooling system. It is the latest generation product for sealing the cooling system leaks. Completely eliminates leaks, permanently and reliably seals hair cracks and minor damages up to 0.9 mm in the pipelines and joints. Eliminates loose fit of the pump gasket, leakage of cylinder block gaskets etc. Universal application for gasoline and diesel engines of cars and other equipment. Compatible with all types of fluids applied to cooling systems. Safe for parts’ materials of a cooling system (gaskets, rubber hoses, aluminium, plastic and steel radiators). Protects a cooling system against rust and corrosion. Does not contain acids; nontoxic. 1. Shake well before use! 2. Warm the engine up to the working temperature, the engine must be warm but not hot. 3. 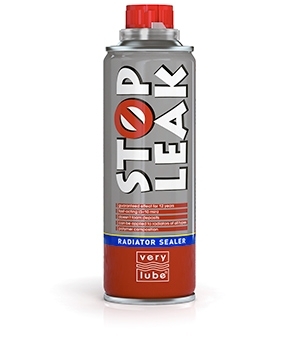 Add VERYLUBE Stop Leak into a radiator tank when the engine is not running. 4. Start the engine and let it idle for 5-10 min with a switched- on heating. The can (250 ml) is designed for cooling system capacity up to 12 L.
The antifreeze in the cooling system is under pressure when the engine is hot. Be careful when opening the radiator / cooling system: hot coolant or steam might escape from the system. To avoid eventual leaks in a cooling system, use the sealer right after changing the antifreeze.